Do you remember a couple of weeks ago that I told you all about a great new Doctor Who cooking group called Time Lord Chefs? For Katie’s first Time Lord Chefs challenge she has chosen the theme of “series 8”, that’s the series where the doctor has newly regenerated and looks like the Earth actor Peter Capaldi. I have still not quite made my mind up about this newest series. I do like our new doctor but only one episode has had me on the edge of my seat. There is a lack of continuity with a different director and writing team for each storyline. A little birdy tells me that Steven Moffat, the current lead writer, has approached Russell T Davies about reviving one of his cunning ideas for linking various strands together, so hopefully the grand finale will bring everything together nicely. I do, however, love the new title sequence for the show. This was based on a short video made by Billy Hanshaw, who is a Doctor Who fan and I love that fan art is influencing the actual programme. The new titles start with swirling clockwork cogs, suggesting the inner workings of the tardis or perhaps the universe itself. 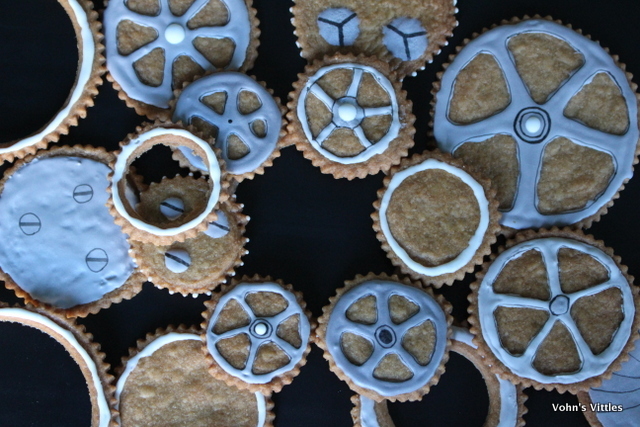 It feels very steampunk to me and inspired me to make these Doctor Who steampunk cookie cogs. I used a simple spiced cookie recipe and then decorated with royal icing, edible silver dust and edible black ink. 1) Sift flour, bicarbonate of soda and allspice together. Rub in butter until resembles breadcrumbs. Stir in sugar. Add egg a little at a time until clumps together as a dough. Wrap in cling film and refrigerate for half an hour. 2) Roll dough on a floured surface to about 2mm thick. Cut into desired shapes & placed on a greased baking tray. Pop into freezer for 15 minutes. Meanwhile preheat the oven. 3) Bake at 170ºC for 5 minutes, then turn tray and bake for a further 3-4 minutes until golden. Remove from oven, leave on tray for a few minutes to harden, then move to a cooling rack to cool. Once cold, decorate as desired. I am entering my Doctor Who steampunk cookie cogs into Katie’s Time Lord Chef event.